Jabra is part of GN Netcom, a global leader in audio solutions. It develops, manufactures and markets headphones and wearables. The company established itself by providing audio equipment to call centres but has recently focused its efforts sports/active audio wireless headphones. Dixons Travel is a leading airport electrical retailer, with stores across the UK and Ireland. Dixons Travel showcases the latest technology at online beating prices suited to every type of travellers’ needs. Jabra’s attendance at the conference gave them an opportunity to showcase their products and share knowledge with the retail staff who sell them to consumers across the country. 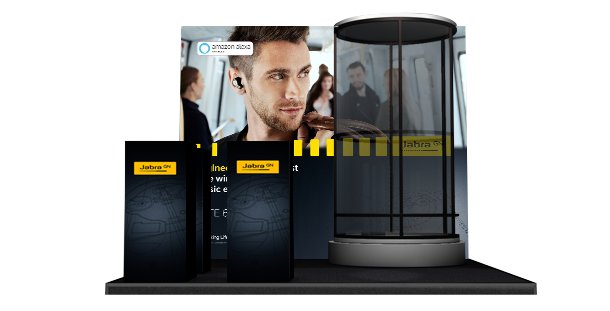 In order to make the most of the event we created a fun, interactive experience which gave Jabra the best opportunity to connect with key retail staff. We featured a ‘cyclone’ game for attendees. This game puts players in a special enclosed booth where giant fans blow balls in the air for people to catch. High scores equal prizes!